We offer dance classes for ages 18 months - adult. Whether you're a beginner, advanced, or somewhere inbetween, we have a class for you! Stretch the imagination through creative dance to support language development and social interaction. This is a great introduction to dancing for children just developing their coordination. The teacher guides the Tall and Tot team in a way that makes discovering movement, balance and listening skills easy and fun. This class is an excellent first group activity. An adult (Tall) must accompany their little one (Tot) for this class. Bare-feet or socks required. Classes limited to 6 students (Tots). Fast paced, fun and creative class. Basic dance is taught in a class structure that our two-year-olds thrive in! Basic ballet and terminology will be covered. Classes limited to 6 students. Introduction to dance with an emphasis on dance foundations, coordination, incorporation of props, and having fun in a highly energized and upbeat class! Basic ballet and jazz are covered. Use of correct ballet terminology is incorporated. Classes limited to 12 students. Continued introduction to Dance with an emphasis on dance foundations, coordination, basic dance terminology, learning dance etiquette, incorporation of props. We focus on an introduction to ballet, jazz, hip hop and pom in a fast paced and creatively challenging atmosphere. Learn all the basics of hip hop in this fun fast paced class! Stylish choreography to age appropriate music provides an energized class. If your child loves to dance at home and make up their own “moves,” then this is the perfect class! Rhythm, noise and funk! Learn the basics of tap and begin combos as well as across-floor combinations in this high paced class! Ballet is the core of all dance. Classical ballet focuses on body placement, proper technique, body alignment, flexibility, strength and skills. This class is a great way for those students who really want to focus on ballet at a younger age. Class is creative and challenging. Tumbling at its best! This class is an introduction to all the fun tumbling exercise that our little ones love in a safe environment. Students will learn several different acrobatic skills which build in difficulty as the class progresses. Cartwheels, forward roll, somersaults, back-bends, back walkovers, and so much more! Ballet is the core of all dance. Classical ballet focuses on body placement, proper technique, body alignment, flexibility, strength and skills. You must take ballet to become a well-rounded dancer. As you progress through Intermediate and Advanced levels, more choreography, style, interpretation and skill difficulty will be introduced. Foundation: open to anyone ages 7 - 18. Intermediate: 2 years in Ballet Foundation and between 9 - 18 years old. Advanced: 2 years in Ballet Intermediate, between 11 - 18 years old, instructor/director endorsement, and enrolled in another Foundation/Intermediate class. Intermediate: 2 years in Jazz Foundation and between 9 - 18 years old. Advanced: 2 years in Jazz Intermediate, between 11 - 18 years old, instructor/director endorsement, and enrolled in another Foundation/Intermediate class. 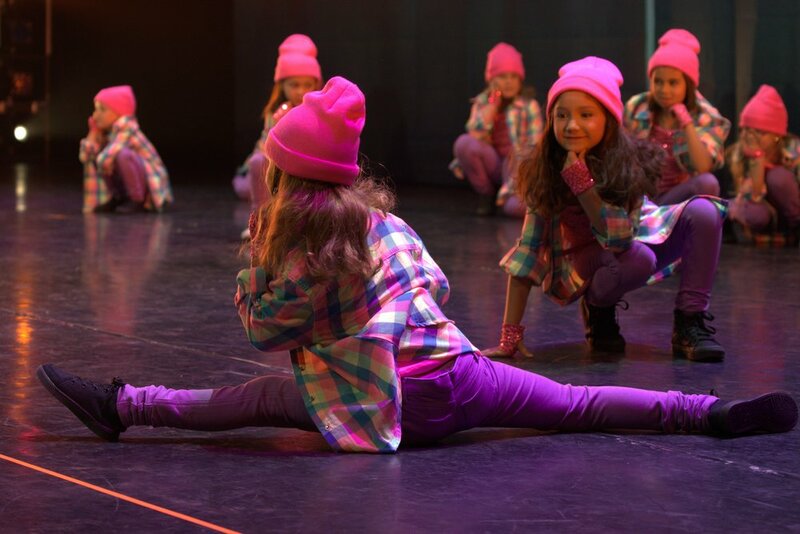 Intermediate: 2 years in Hip Hop Foundation and between 9 - 18 years old. Advanced: 2 years in Hip Hop Intermediate, between 11 - 18 years old, instructor/director endorsement, and enrolled in another Foundation/Intermediate class. Lyrical dance is expressive, focused on conveying musicality and emotion through movement. It is a combination of intricate, highly technical, and pedestrian/naturalistic moves. Lyrical inspires choreographers and dancers to use movement to interpret music and express emotion. Intermediate: 2 years in Lyrical Foundation and between 9 - 18 years old. Advanced: 2 years in Lyrical Intermediate, between 11 - 18 years old, instructor/director endorsement, and enrolled in another Foundation/Intermediate class. Rhythm, noise and funk! Tap teaches the art of percussive strikes on the floor using different parts of the foot. After learning the basics of tap, you'll begin simple combinations and across-floor combinations in this high paced class! Intermediate: 2 years in Tap Foundation and between 9 - 18 years old. Advanced: 2 years in Tap Intermediate, between 11 - 18 years old, instructor/director endorsement, and enrolled in another Foundation/Intermediate class. Learn how to do skills and tricks that you can incorporate into your dance routines. Learn the basics and progress to harder skills in a safe environment. Back layout, back tuck, back walkover, cartwheel, front and back somersaults, chest stand, elbow stand, front aerial, handspring, handstand, hand walking, kip up, round off,, side aerial, valdez and strength training will be included in these classes. Safety mats will be provided. Classes taught by certified tumbling instructors. These classes are designed to reinforce the basics to students that are either brand new to dance or need additional work to help them in their current classes. It is highly recommended that you take one of these classes if you have never danced before in conjunction with the class of your choice. Instructors may also recommend this class to students throughout the year. For existing students, consider this valuable structured practice time on an actual dance floor.